In the Philosophy of Right, Hegel presents an outline of the modern state which attempts to preserve the freedom of individuals and grant an independent and necessary existence to the state. To achieve this aim, the main problem which Hegel must overcome is how to reconcile the self-interested individual with the universal interest of the state. He outlines three processes whereby this selfinterest is universalized: the inherent rationality of civil society, membership of a corporation, and the ‘harmonization’ of private and universal interest. As I see it, however, in all three of these cases Hegel either sacrifices the necessity of the state or the freedom of the individual, thus failing in his attempt to perfectly reconcile the two. I will begin my analysis by looking at the three ways in which Hegel claims that self-interest is universalized, pointing out the insufficiencies of each and the problems which they create. 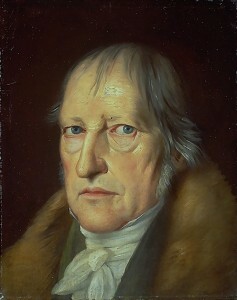 Having laid out the problematic nature of Hegel’s conception of the individual, I will conclude by suggesting that his failure to accomplish his stated aim is largely due to his definition of the individual as unable to autonomously transcend private interest, a definition which I will argue is open to contention. This entry was posted in Philosophical and tagged Hegel on 14/06/2018 by Mary.